My love for bread is the very reason I work out. Carbs are yummy and I just can’t let go of them. So I exercise and call it good. The bread machine is one of my enablers. It wasn’t always that way. For a few years after we got married, it sat in the closet because I had no idea the wonders it could perform. Then recipes like this one came along. 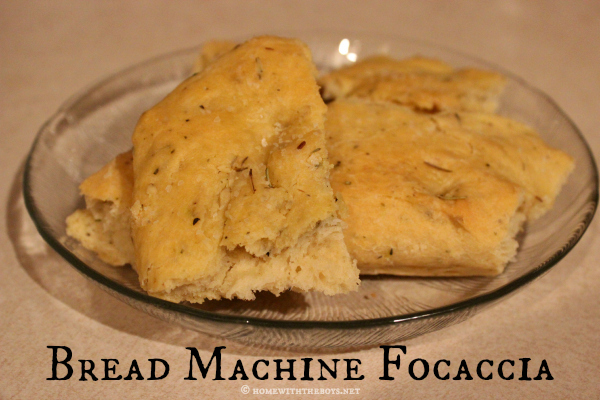 Who knew you could make yummy, flavorful focaccia in a bread machine?! In the interest of full disclosure, you just make the dough in the machine, but that’s what makes this so easy! After it’s done mixing up in the machine, just flatten the dough into a pan, dimple and doctor it up a bit, and bake in the oven. You may love me for this. You may hate me for this. I’ll take the bad with the good because I believe we should all eat really delicious bread at least every once in a while. I’ll work it off with T25 tomorrow. Select dough cycle; press start. Remove dough from bread machine when cycle is complete. Pat dough into a 9×13 inch baking pan or 12 inch pizza pan. Use your fingers to dimple the dough every inch or so. Brush with remaining 2 Tbsp olive oil and sprinkle with kosher salt and remaining 1 tsp rosemary. Preheat oven to 400 degrees. Cover focaccia with plastic wrap while oven preheats. Bake in preheated oven for 20 to 25 minutes, or until golden brown. Let cool for 5 minutes before serving.